I grew up eating red beets from a can and hated them. I thought all beets were nasty and then one day I had a freshly cooked one. My life changed forever that day. I had been invited to join a friend for a day of wine tasting with a group of wine connoisseurs. I was very far from that elevated level, but I enjoyed wine and of course spending time in Napa Valley has always been one of my favorite activities. This was going to be a fun new experience and as a young woman in my twenties, I was up for an adventure! We turned off the main road in St. Helena and drove up the curvy country road, climbing higher and higher until we were seemingly miles above the valley floor. We turned down an even smaller lane and arrived at Cain Vineyards. The vistas were breathtaking and I couldn’t wait to start our event. We sat down to lunch and I was excited to experience my first chef created food and wine pairing but nervous that I would do or say the wrong thing. I was WAY out of my league, but confident that the training I received in table manners and pleasant dinner conversation from my parents had trained would stand the test. I’m happy to say I didn’t totally embarrass my friend or myself that day. Platter of fresh vegetables, ready to be turned into supper! Lunch arrived, and on my plate were some slices of a vegetable I didn’t recognize – they were fresh beets. I took one bite and it was a revelation. I not only didn’t hate them, I loved them! I exclaimed that they tasted like the earth and everyone stared at me with bemused expressions on their faces. What in the heck was I talking about? But I didn’t care if they laughed out loud, I was in love with a vegetable that I had never experienced before. I have no memory of the rest of the meal (I’m sure it was exceptional) but can still taste that first bite of roasted beet. Cain wines remain some of the finest made in Napa Valley and a favorite, but out of my price range most of the time. Beets, on the other hand, happily are regularly seen in our home and in my menus. Today Food Network’s #SummerFest is focusing on beets. I wanted everyone to experience the pure, simple beauty of their flavor and created a very simple preparation for you today. Roasting brings out the natural sweetness and combining them with potatoes and poblano peppers, creates a balanced and flavorful side dish or vegetarian/vegan main course. Make sure you check out all the other recipes from my very talented friends below and head over to the Food Network’s Pinterest page to see all of our weekly postings. With sweater weather nipping at our heels, this dish will keep you and your family happy and healthy all winter long. I hope you fall in love with beets the same way I did ~ and if you love wine, add a beautiful bottle to this meal and you’ll swear! Cutting the beets and potatoes about the same size will help them cook at the same rate. When working with red beets, always wear an apron or clothes you don’t mind getting stained. The dish is naturally gluten-free! Preheat the oven to 350°F. Set out a medium baking dish (such as an au gratin) and a 9x13-inch baking pan. Cut the stems and roots off the red beets. Peel them and cut into small chunks. Place them in the smaller baking dish and set aside. Rinse your hands well to avoid staining. You need to cook the red beets separately from everything else so that you don't wind up with pink vegetables. Tossing the cooked red beets in at the end will reduce the staining of the natural juices. Cut the stems and roots off the yellow beets, peel and cut into small chunks. Place them in the larger baking dish. Cut the potatoes into chunks the same size as the beets and add to the larger pan. Chop the poblano peppers and onion into pieces about 1/2-inch-square. Drizzle the red beets with 1 tbsp of the oil and the remaining 2 tbsp of oil over the vegetables in the larger baking pan. Sprinkle both pans with some of the rosemary, thyme, salt and pepper. Toss until everything is well coated with the olive oil and the seasonings are evenly distributed. Cover both baking dishes with foil and place in the oven and bake for about 30 to 45 minutes. Check the beets with a fork and remove from the oven when they are easily pierced with the tines. The actual length of time will depend on how large your chunks are. The larger your chunks, the longer they will take to get tender. Remove from the oven and set aside to cool slightly. Very carefully remove the foil cover and toss to redistribute the oil and seasonings. Taste and add more salt or pepper if needed. Using a slotted spoon, add the red beets to the rest of the vegetables and toss together. Discard the red-stained olive oil. Serve immediately or cool, cover and refrigerate to serve them the next day. You can eat these vegetables as is or use them as the base for a delicious salad with vinaigrette. I love them both ways! Make sure you check out all of these delicious beet recipes from my blogging friends! This dish, or similar ones, became my go to side dish for summer potlucks. People loved the rosemary potatoes. Adding the beets made a splash of color and sweetness. Love this! Jane – I too disliked beets until I tasted my first roasted beet several years ago. I’ve been a fan ever since. It’s all in the way it’s cooked. 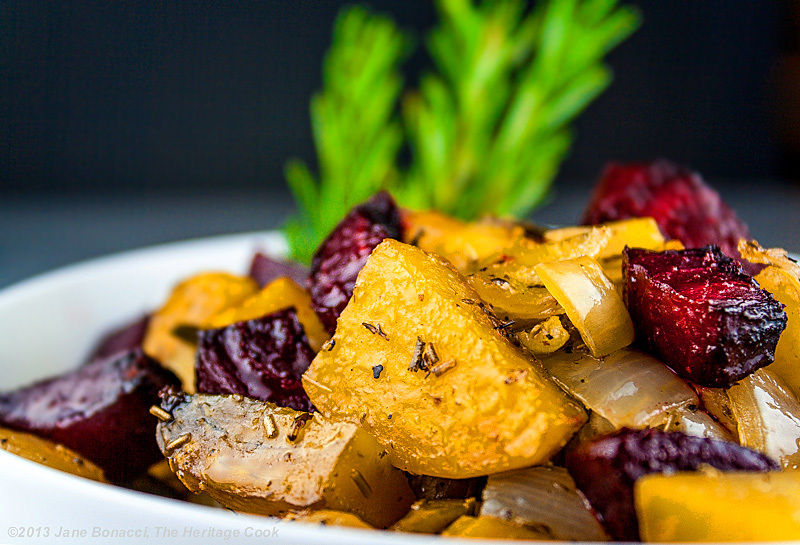 Your roasted beets with rosemary sound delicious and right up my alley.